Months ago, Aidan requested her birthday cake. Never mind there was still snow on the ground, she was dreaming of her July birthday and a handsome lemonade cake. Over the next few months, I kept my eyes open for lemon cake recipes and ideas and found several. On her birthday, I pulled them together and made a cake that I rank as one of my best, ever. It was fabulous and I will make it again. It’s no fun keeping it to myself, so I am sharing these recipes. I found the recipe at Cooking Light, but I modified it so it wasn’t actually…light. It’s not like we cram cake on a daily basis, so I feel something like birthday cake deserves the full-on buttery, fatty, creamy treatment. Put first 5 ingredients in a large bowl; beat with a mixer at medium speed until well blended (about 5 minutes). Add eggs and egg whites, 1 at a time, beating well after each addition. Lightly spoon flour into dry measuring cups; level with a knife. Combine flour, baking powder, salt, and baking soda; stir well with a whisk. Add flour mixture and buttermilk alternately to sugar mixture, beginning and ending with flour mixture; beat well after each addition. In a large mixing bowl, slowly combine powdered sugar and softened butter until it makes a thick mix. Once you know you won’t have powdered sugar flying all over the kitchen, mix on medium for 3 minutes. Add vanilla and lemon juice. Slowly add milk, watching closely for the consistency you desire. I used the full 1/4 cup of milk, which made it on the softer side. This was okay with me because I knew I was going to store the cake in the refrigerator for about 8 hours before serving, so the frosting would firm up. Think of all that butter. If you are serving it immediately, consider adding less milk. If it’s too runny, add more powdered sugar. You can go back and forth all day long, really. I frosted the two-layer cake with this and had enough left over to have a few spoonfuls for quality control purposes. 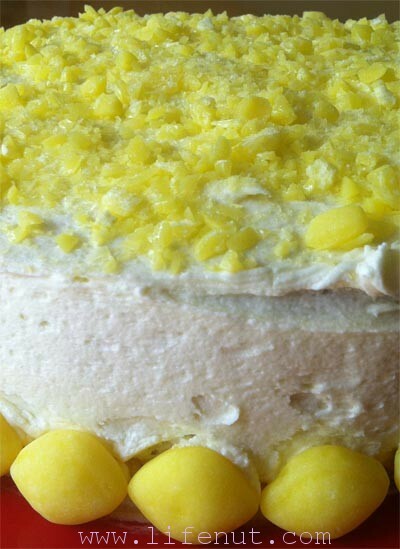 Originally, Aidan wanted the top of her cake to be littered with lemon drops. This didn’t sound ideal to slice or bite. My mom suggested crushing the lemon drops and sprinkling them on top. I thought it would be easier than it was. Perhaps I went about it the wrong way and I’d be happy to take suggestions for the next time I make it. Learn from my folly. I poured 1/2 of the lemon drops into a sandwich bag, underestimating how tough the lemon drops are. Wow: Diamonds meet a 3-year-old’s determination he wants to wear fleece footie pajamas to bed in July. One bash from my rolling pin split the sandwich bag and sent lemon drops flying. I decided a tougher baggie was needed, so I moved the remaining lemon drops to a giant freezer bag. I began to bash and bash and bash, astonished by how hearty they were. Finally, they began to split and powder. My goal was a mix of small chunkier pieces and finer powder for a textured appearance. I sprinkled the decimated lemon drops over the top of the cake. With the remaining unassaulted lemon drops, I decorated around the bottom of the cake. And which version do I make if we *do* cram cake on a daily basis? Can’t wait to try it, Gretchen. Yummo! Looks and sounds heavenly! Thank you for sharing. Happy birthday, Aidan! My mouth was watering and puckering as I read about it. I might of tried using my blender to grate the lemon drops but they may have been hard even for it. It also, looks beautiful. This looks good. I’ve never thought of a lemonade cake! But, I love me some cream cheese frosting so…I don’t know…yours looks good too! Nicole recently posted..Nicole’s Favourite Things: Summertastic! I wish you had a pinit pin. So I could put it on pinterest. I have a July baby too and have been in search of the perfect recipe. This might just be it. Thank you and Happy Birthday to your girl.